CONSIDER THIS HANDSOME PIECE OF FURNITURE YOUR PERSONAL BUTLER! A valet stand is a luxury piece of furniture that very quickly becomes essential to everyday life. It adds style and functionality to your bedroom or closet. The StorageMaid Standing Valet helps you beat the morning rush to get ready by providing a safe, wrinkle-free place to keep clothes the night before. Use your StorageMaid valet to drop off clothing and accessories after a long hard day, as well as for preparing your clothes for the next morning. Having a CLEAR MIND AND A CLEAR SPACE allows you to THINK and ACT with PURPOSE. StorageMaid makes it easy for you to be the gentleman who always looks put-together! It's More Than A Clothes Hanger -- It allows to hang light or heavy clothing or other items in the way of a stacked / cascaded fashion and keeps them separated nicely. It's convenient for you to see and get what you need in a second, so you no longer have to mess up your rooms in order to find your clothing or other items. More Hanging Positions -- 6 Hooks as hanging positions (0.71-in long each, and 1.45-in apart) for hanging more clothes, towel, bag, hat, necklaces and so on. Tips -- Remember to hang your favorite and commonly used clothing or other items in a conspicuous or handy position. Space Saving Hanger -- Swing the arm easily 180 to the left or right. In order to save more space, you can swing it close to the wall, even disassemble the swing arm when not in use. It's ideal for closets, bedrooms, bathrooms, laundry rooms or other rooms. High Quality Materials -- Made of high quality and fine-brushed SUS 304 stainless steel. 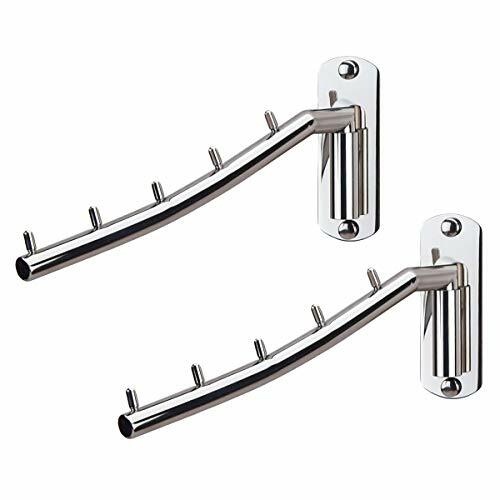 Included 2 Clothes Hanger (Length: 12.60-in), 2 Wall Mount Base (Size: 2.36-in x 2.36-in). 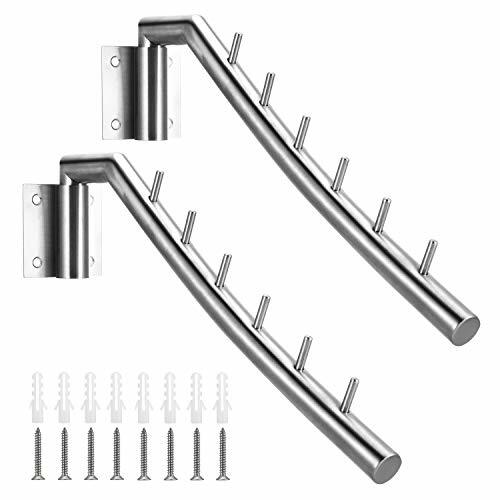 and 8 Screws with Drywall Anchors for mounting (1.18-in long each). The EZOWare Valet Stand Rack offers an updated spin on a classic piece of furniture. The freestanding valet is constructed of rich dark stained wooden hanger bars with black metal support bars for attractive, sturdy, heavy duty and long-lasting use. The hanger and rods make it easy to to plan, visualize, and hang a coordinated outfit ahead of time. It even includes a tray space and top essentials bar for accessories and ties. A great way for professionals to keep focus in the mornings without having to steam or iron outfits last minute. Contoured coat dress shirt garment bar. Top bar to hang a tie, bowtie, scarf, hat or watch. Tray for cufflinks, wallets, and smaller items. Trousers bar to hang slacks, pants, or jeans. Space at the bottom to coordinate, storage and place dress shoes, boots, or sneakers. Extra space to hang or place all the extras that tie together the perfect outfit. Assembly required, tools and hardware included. Easy to put together, simply follow the included directions. Dimensions: 13.8 x 17.3 x 41.3 inches (35 x 44 x 105cm). Designed with professionals in mind, EZOWare Valet Stand provides ample space to organize and prepare the perfect power suit or casual outfit without the worry of last-minute wrinkles or unwanted creases. Perfectly Coordinated: An all-in-one essential for walk-in closets or bedrooms. 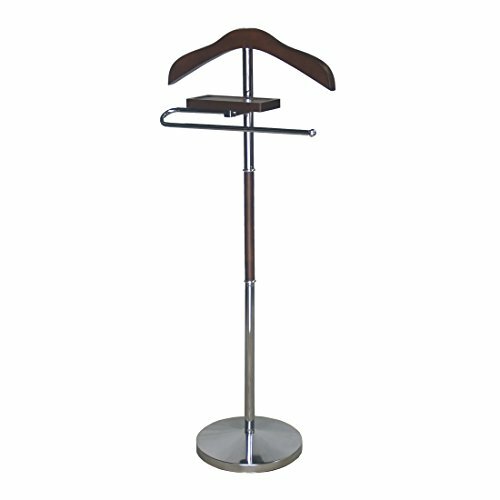 The free standing rack features a contoured jacket, shirt and coat hanger with a front slacks / trouser hanger bar. Plenty of space at the bottom to pair your outfit with dress shoes or sneakers. Top Essentials Bar: Extra smooth contoured bar at the top to drape over ties, bowties, belts, scarves, hats, or watches so you can easily visualize and coordinate the perfect look. Accessories Tray: There is a small tray to place a wallet, cuff links, tie clip, fountain pen, or pocket handkerchief. An easy way to plan out and not overlook the smaller details. Dimensions: 13.8 x 17.3 x 41.3 inches (1.15 x 1.44 x 3.4ft) (35 x 44 x 105cm). Material: Wood & Metal. Assembly required, tools and hardware included. The Corby 3300 removes wrinkles from your pants and refreshes a smart crease, through a gentle pressing and heating action. This press has a beautiful and hard-wearing mahogany finish. The Corby Pants Press is manufactured in England and has been refined over 80 years of development and you can be rest assured with a 3-year manufacturer's warranty. The Corby 3300 removes wrinkles from your pants and refreshes a smart crease, through a gentle pressing and heating action. This press has a beautiful and hard-wearing satin black ash finish. The Corby Pants Press is manufactured in England and has been refined over 80 years of development and you can be rest assured with a 3-year manufacturer's warranty. Oxford II valet stand is a great personal storage unit to hang your coat, suite, and personal items. With its stylish yet elegant looking design, it can fit into any room setting. Perfect for keeping an outfit neat and handy. Dimension: 18.5" W x 11.5" D x 43.5" H Weight: 10 lbs. Are you upset that your husband put his daily working clothes, robe or pajamas on the chair and make your bedroom/living room look quite clutter? Do NOT want your office look disordered with your scarf, suit, jacket or winter coat scattered on your table, chair or sofa? 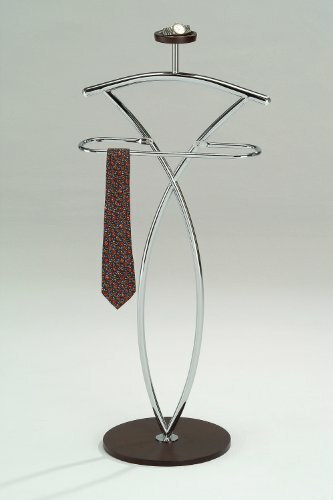 It won't be a problem anymore if you choose WILSHINE clothes valet stand for men. 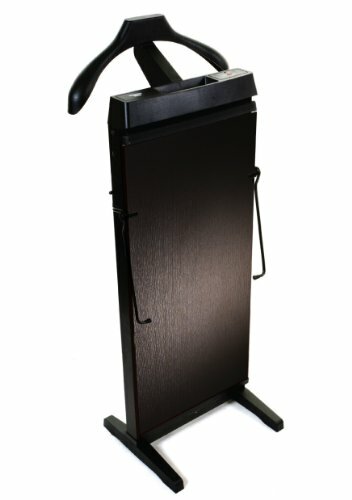 This suit stand features a sturdy triangle base with 2 hangers, an upper one for shirts and coats and a lower hanger for pants. There is also a tray specially designed for wallet, keys, coins or other small things in your pockets. 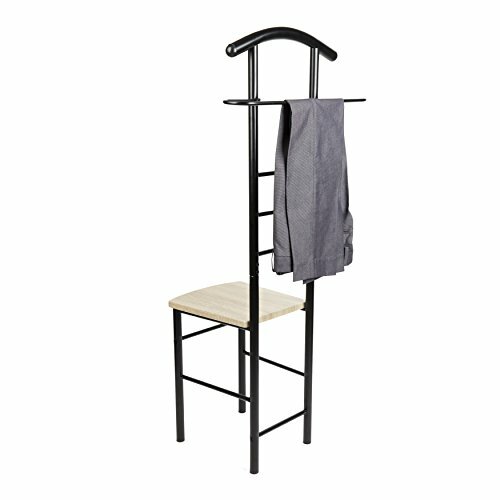 This valet stand is a great way to organize your clothes while keep them wrinkle-free and ready-to-wear. When you are in a hurry to go out, you can grab your clothes quickly and easily. Three black rubber feet beneath the triangle base could protect your floor from scratches and keep the whole suit rack stand from tipping over on a slick floor. Make sure that the top angle of triangle base faces front, to prevent the stand from tipping over. It is easy to clean by wiping with a damp cloth, do not use abrasive cleaners. Dimensions: 19W x 18D x 47H in. A solid hardwood texture with a Mahogany Wood finish Includes a circular tilt mirror. Equipped with: A trouser hanger bar, Jacket hanger, 3 chrome shoe bars, Tie and belt hanger, A tray organizer and metal bar for keys or wallet. Sleek lines and an unobstructed silhouette make this slender Danya B Black Chair Valet a modest yet modern addition to your living space. The valet chair has multiple purposes - hang your coat on its oversized back, use tubing to hang pants, ties or scarves, and use it as seat when getting ready! No matter what you use it for, this piece is sure to save on lots of space with its narrow body. The black iron tubing frame elegantly contrasts with the light wood tone of the seat. The Danya B Black Chair Valet is contemporary flair and functionality all in one. Sleek lines and an unobstructed silhouette make this slender valet chair a modest yet modern addition to your living space. The valet chair has multiple purposes - hang your coat on its oversized back, use tubing to hang pants, ties, belts or scarves, and use it as seat when getting ready. Includes an oversize back for hanging jackets, large hanger that can fit slacks, ties and scarves, and comfortable chair to dress or undress. The black iron tubing frame elegantly contrasts with the light wood tone of the seat. Contemporary flair and functionality all in one. Brand: Danya B | Manufacturer: Danya B. 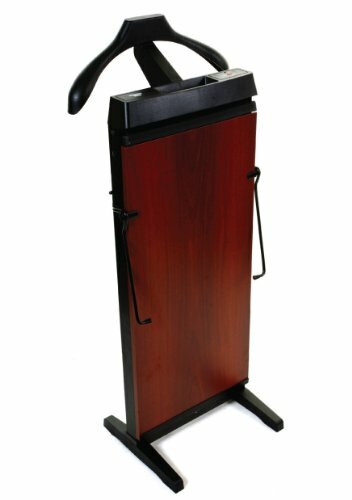 This Valet stand keeps great organization of your suit, dress shirt, shoes and accessories within reach. Sturdy construction with rich espresso finish.Features includes coat/shirt hanger, bar, mirror and drawer. Kings Brand Walnut Finish Wood & Metal Suit Valet Rack Stand Organizer. Dimensions: 21.2' x 11.4' x 42.1'H. 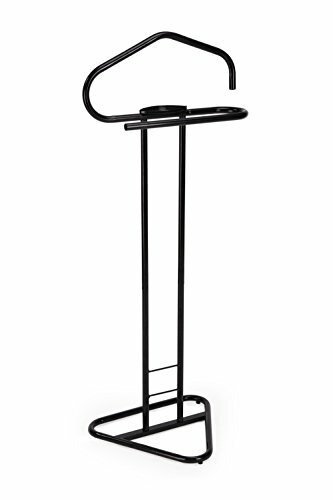 Knight valet stand is a great personal storage unit to hang your coat, suite, and personal items. With its stylish yet elegant looking design, it can fit into any room setting. Perfect for keeping an outfit neat and handy. Rustproof Rack: Made from SUS304 premium-grade stainless steel, with 18/10 Chromium/Nickel coating and fine polishing process. Shining surface, a good looking, prevent corrosion and rust. Space Saver: The clothes hanger can swing 180 degrees to the left and right so keep it close to the side when you don't need it.Gives you an instant clothes closet anywhere; perfect for small spaces, out-of-the-way corners, bathrooms, on a porch or deck, and much more.It's Very durable and sturdy,a nice space saving design. Multi Applications: Ideal for bathroom, bathroom, closets, office and other scenes you need. It also looks neat and attractive and matches other accessories at home. Use your imagination, it not only can hang clothes, also can hang hat, bag,necklaces where they wouldn't get all tangled up and so on. Handy, Tidy - It's such a simple idea, but keeps hangers off the shower rod. They are that just that handy for anything from hanging shirts to prevent wrinkling if left too long in the dryer, to using as a valet to lay out the clothing. 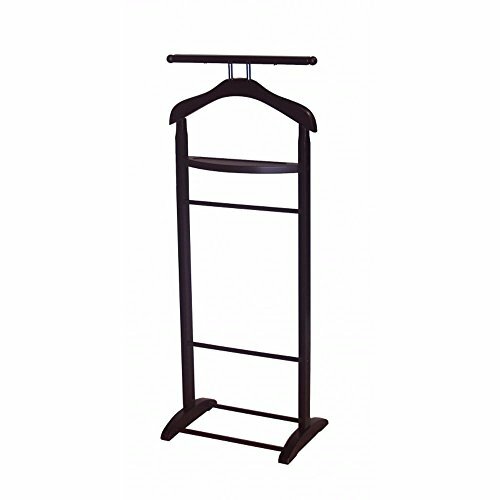 A valet stand is a luxury piece of furniture that very quickly becomes essential to everyday life. It adds style and functionality to your bedroom or closet. The StorageMaid Valet combines a modern design with a traditional piece of furniture. It Is easy to assemble and does not take up too much space. The upper curved arch is ideal for a jacket, coat, or blazer; the lower rod provides a place for slacks and the third rod in between is the perfect place to hang ties, hats, and other accessories. Keep It In Your Entrance As A Standing Hat And Coat Rack Place It Strategically In Your Bedroom For Easy Reach Select "This Item Is A Gift" At Checkout And We'll Ship It Straight To Your Bestie, Free Of Charge! LET YOUR FURNITURE REFLECT WHO YOU ARE: BE HANDSOME, BE CHIC AND BE SMART; GET YOUR STORAGEMAID VALET ROD NOW! 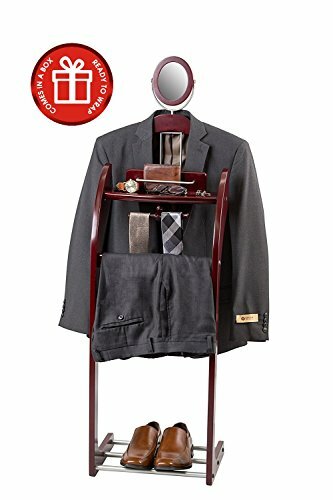 BEST GIFT: Present This Modern Suit Valet Stand As A Much-Appreciated Housewarming Gift, Going To College Gift, And For Any Other Occasion; Expect Rave Reviews Only! The is our brand new men double suit shelf perfect for home and office use. 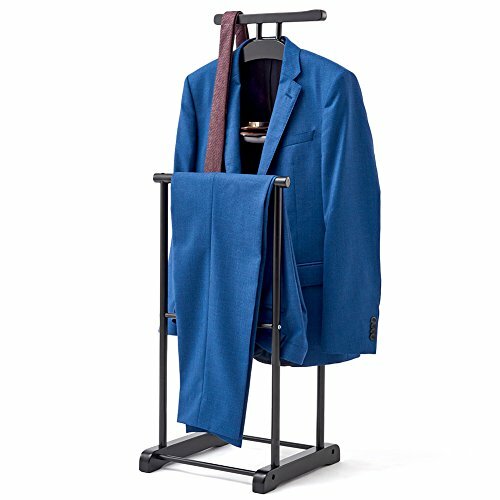 For classic gentlemen, this elegant suit valet stand is guaranteed to impress guests, while remaining entirely useful in an everyday way. The whole piece is so functional that you can well to organize more coats, suits, jackets and shirts. 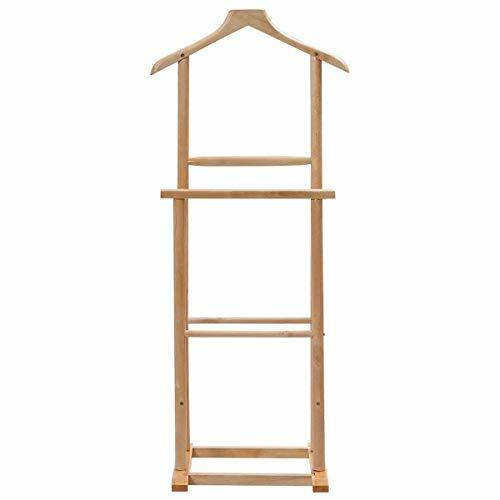 Hanger for jackets and suits and trouser rack for pants good quality wooden can served for a long time using. Moreover the base of the double suit shelf is also a shoe rack for convenience. It is double suit rack which is more stable than others. Don't hesitate to buy it now! Product Size: In front of the shelf:36*36*66 CM 14"*14"*26"
The rear hanger: 36*36*107CM 14"*14"*42.1"
Elegant Appearance & Practical--- The suit stand comes with compact and simple design. It equipped with suit hanger, one round bar for trousers, another bar for ties or scarves and shoe rack. 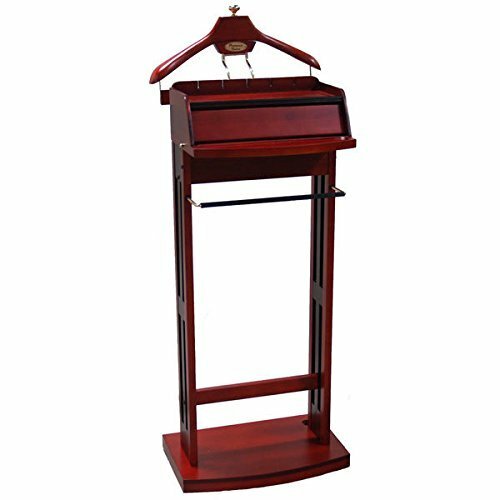 Environment Friendly--- The suit stand is made of high quality birch wood and covered with safety oil paint. Natural material is green and healthy. Side rod construction makes it more stable.It will serve you for a long time. 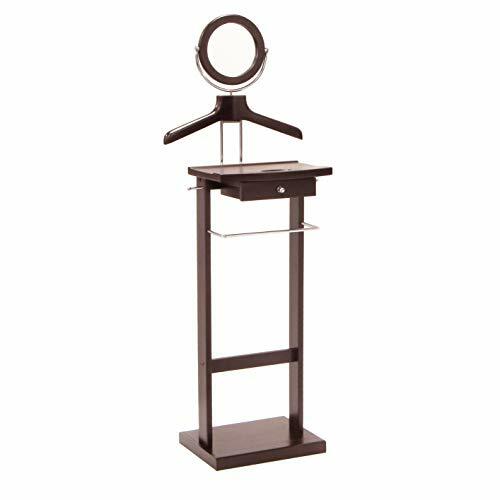 Compact for your room--- This suit stand is slim and elegant. The natural color is perfect for Nordic style room and brown one is perfect for vintage style.It can be put in the bedroom, entry way or other small places. Easy to Assemble & Clean--- Don't worry about installation. With clear manual you can finish it in half an hour or less. All necessary hardware are included. And you can wipe the dust with wet cloth softly. Shipping & Customer Service--- Ups or usps will deliver the item to your house in 3-6 business days after you placed an order. If there are product damage or quality problems, please contact us at the first time, we will provide you with the most satisfactory after-sales service. 1.Perfect for home and office use. 2.Well organize more coats, suits, jackets and shirts. 3.Good quality wooden can served for a long time using. 5.Double suit rack which is more stable than others.